How do you break out of a slump? The answer is by not thinking about how to break out of the slump. It may sound odd, but if you think about the slump, even breaking out of the slump, you are actually reinforcing the slump in your mind. Chances are the word that really stands out is “slump”. A couple words or phrases may stand out to you in this sentence, such as, “break out” or “aggressive” but the word “slump” still strongly impacts your mind. So, how do you actually break out of a slump? The best way to break out of a slump is to be task-specific. In other words, come up with a game plan for the specific team you are about to face and execute the plan. It’s not a matter of trying to win, but the focus should be on executing the plan to the best of your abilities. That requires each player on the team to focus on their role or assignment for the game and let the cards fall where they may. If you were to sit back and examine your team’s victories, rarely, if ever, were you thinking about winning. When you played your best hockey, you were focused on the game plan that was created prior to the game. Chances are you pick out the phrases “dump and chase” and “forecheck aggressively”. This places the focus squarely on the game plan and not the potential outcome of the game. To sum up, the plan should be to focus on the plan. That is the most effective strategy to break out of a slump. The Vegas Golden Knights experienced a 4-game skid losing four straight regular-season games for the first time since entering the league. After their 3-1 loss to the Florida Panthers, Vegas goalie Marc-Andre Fleury commented on the nature of slumps. The Golden Knights focus on the next task at hand. Coach Gerard Gallant’s message to the team is that it is on to the next game. How are you going to get out of your next slump? What will you focus on to break out? Get into the habit of focusing on a game plan for each game. Each game, write out 1-2 objectives. Before the game, review the plan. Pick 2-3 words that summarize the plan. When your mind drifts to the potential final score, remind yourself of the plan. 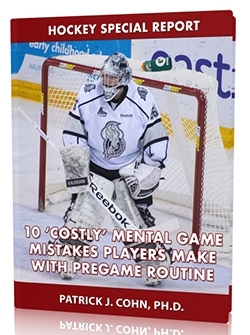 To break our of a slump, be proactive with your mental game. Don’t wait for your performance to turn around before you can feel confident again. Instead, work on your confidence and let your performance follow. 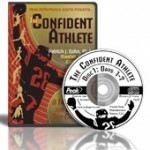 You improve confidence by reminding yourself of your talents and getting the most out of your training. 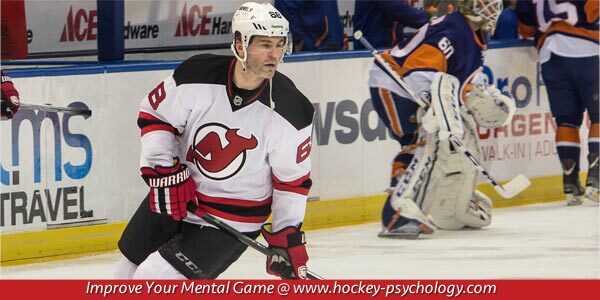 Boost Your Confidence in Hockey!